Back on the 29th, my friend Sid and I had an open day to jump in the car and go for a drive. We headed to visit a relative of Sids that has some property with an old home dating back to the 1860-1870's sitting on it. It started as an old adobe dwelling and expanded to a beautiful 2 story brick home. Today, the old home isn't lived in and is a bit of an icon in the little town where it sits. It has been detected dozens and dozens and dozens of times including by Sid back in the mid-80's. We decided to add 1 more time to that count. Not a lot was found. The brush and weeds are kept down and some dirt had been brought in to even the surface around the foundation so that scaffolding could be placed to make roof repairs. I was using the EQ800 with the 11"coil, Park 2, 50 tones, iron bias 2, Recovery 6, sensitivity 21. 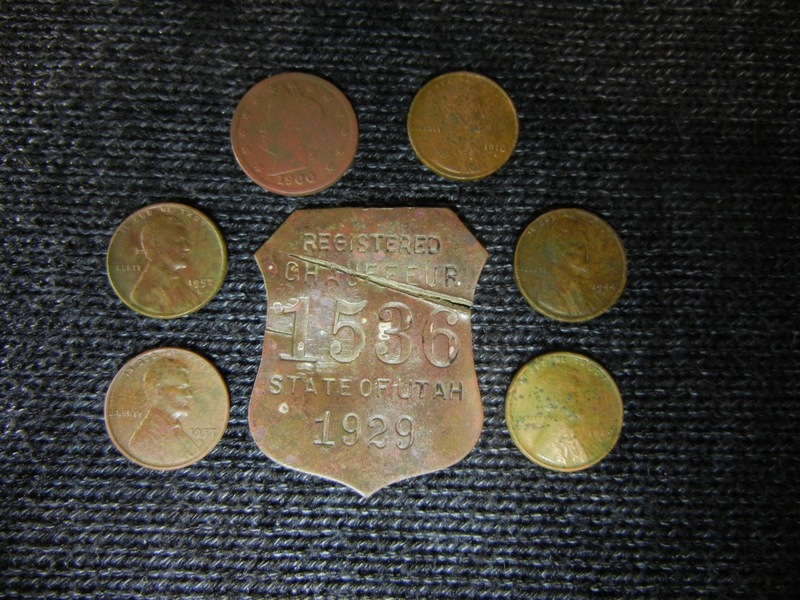 I managed a 1910-S wheatie and a 1929 Utah State Chauffeurs Badge (my first badge like this). I'm pleased with the badge as it was right off the back steps sitting in a bunch of nails several inches deep. Somehow or other it has been missed by everybody over the decades. We also had access to a couple other yards of old homes, one in the late 1870's. This 1870's home had also been hunted, but with careful searching i managed 4 wheaties, mostly newer dates, and a 1900 V nickel at 8". Not much of the normal trash that we usually find around old homes. Sid also found a few wheaties and a lovely old watch fob. In total, we hunted about 5 hours until just after dark. It had been beautiful fall day and we had lots to talk about on the long drive home.